Second Third: Leather, cocoa, black pepper, earth. Overall the aromas of this cigar are very well balanced, and none moves overtly forward and dominates the others. Earth, cocoa, caramel, wood, toasted rice, subtly fruity overtones. This vitola is easy to enjoy any time of year and pairs well with most beverages due to the fact that its aromas and flavors are so well balanced and harmonious, and are not too particularly assertive. In the warmer months, I like to enjoy it with a vintage champagne—and in the cooler months, a lighter rum, a cappuccino with whole milk, or an aged bourbon with a higher percentage of wheat in the blend. An excellent cigar. Probably my favorite Churchill next to the Saint Luis Rey Churchill which is very very hard to come by these days. Careful storage of this vitola is key–too much humidity and it will be soft. If stored at a higher humidity (above 68 or so percent) it is critical that before serving it is left out to equalize to a lower humidity for several hours. If you have the time, dry box them for a day or so. Although this vitola has all the characteristics of a Bolivar, I always find it to be on the subtle side in that the aromas and flavors aren’t as persistent and don’t particularly build in intensity as the cigar is smoked. I’ve held this particular box for about 5 years, smelling from time to time, and felt the time was right to taste one as the smell of ammonia had dissipated significantly. 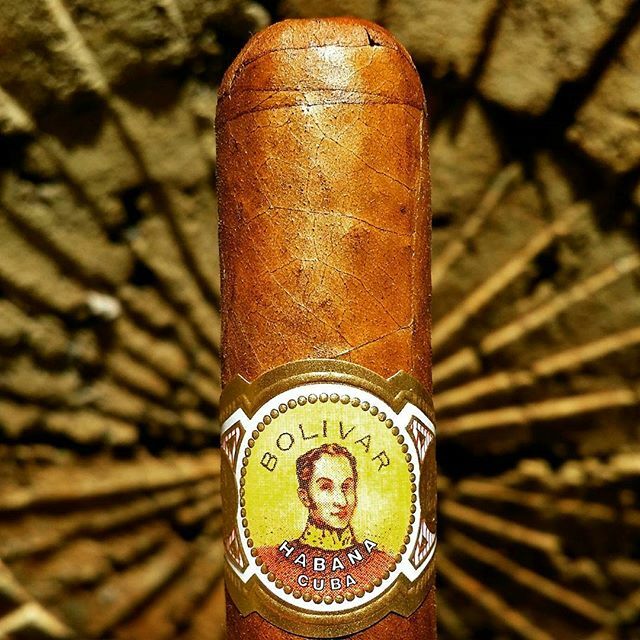 The pre-light aroma was all wood and nuts–which is a little odd because I don’t associate wood as an aroma that Bolivar cigars are known for. Perhaps it was this particular vintage. Once lit, the burn was terrific and the cigar developed beautifully over the hour and half it took me to smoke it. It evolved slowly, with leather and spice aromas giving way to cocoa, a bit of spice and in the finale, lovely caramel and burnt sugar.